Frazer Harrison/Getty ImagesChristopher Nolan isn’t the biggest fan of 3D. of “Interstellar” Monday, two women sitting behind me were surprised we weren’t seeing Christopher Nolan’s film in 3D. When the the director’s newest film rolls out in theatres nationwide Friday, you’ll be able to see it in six formats, but not one of those will be 3D. In a 2012 interview from the Associated Press, the “Inception” director explained why his films aren’t seen in digital 3D. Warner Bros. would have been very happy, but I said to the guys there that I wanted it to be stylistically consistent with the first two films and we were really going to push the IMAX thing to create a very high-quality image. I find stereoscopic imaging too small scale and intimate in its effect. 3-D is a misnomer. Films are 3-D. The whole point of photography is that it’s three-dimensional. The thing with stereoscopic imaging is it gives each audience member an individual perspective. It’s well suited to video games and other immersive technologies, but if you’re looking for an audience experience, stereoscopic is hard to embrace. I prefer the big canvas, looking up at an enormous screen and at an image that feels larger than life. When you treat that stereoscopically, and we’ve tried a lot of tests, you shrink the size so the image becomes a much smaller window in front of you. So the effect of it, and the relationship of the image to the audience, has to be very carefully considered. And I feel that in the initial wave to embrace it, that wasn’t considered in the slightest. Without the added boost of 3D ticket sales, “The Dark Knight Rises” made over $US1 billion at the box office worldwide. It’s not that Nolan necessarily dislikes the format overall. At CinemaCon earlier this year, the “Inception” director praised Baz Luhrmann’s “The Great Gatsby” in 3D after its release. 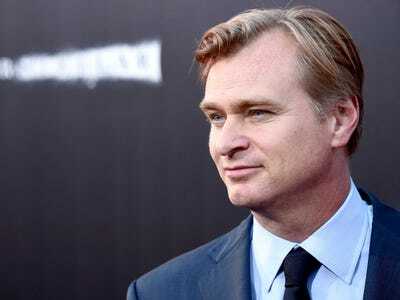 “My resistance to 3D is purely based on what I feel is right for the films I want to make,” Nolan told The Wrap earlier this year.